A group of civil society and social activists called the People’s Alliance for Right to Land (PARL) have reiterated their call to President Maithripala Sirisena to release all occupied lands in the North and East, in keeping with his pledge to do so in October 2018. The group wrote to the President, Prime Minister and all party leaders on the issue last December, and the latest letter comes amidst reports that many displaced persons were unable to celebrate Thai Pongal in their homes this year as well. PARL said its previous letter President Sirisena had received “no response”. It added that large tracts of lands remained inaccessible to displaced residents, and urged the President to keep his promise to release lands in the former conflict zone. “On October 4, 2018, the Presidential Media Division reported that “President Maithripala Sirisena instructed the authorities to complete the process of releasing the lands in the North and East Provinces to their original owners, before December 31, after resolving all the issues,” at a meeting with the Presidential Task Force to monitor development projects conducted in the Northern and Eastern Provinces. “Displaced persons from the north and east, and other concerned persons and organizations, wrote a letter to you on December 27, 2018, appealing to you to honour your promise. But, to date, there has been no response to our letter, and large tract of lands remain inaccessible to their residents, who remain displaced, many for over a decade. 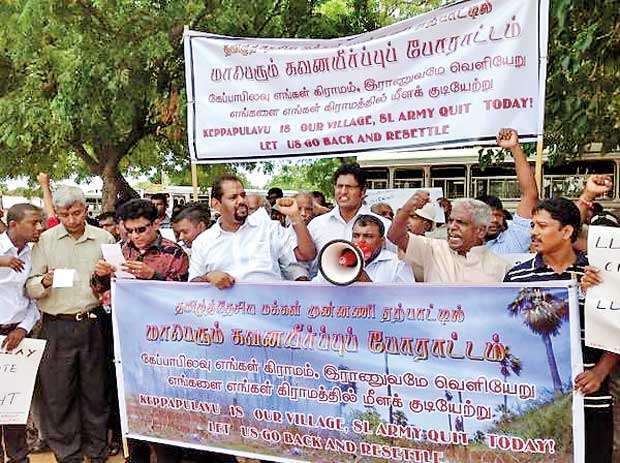 “Therefore, we are once again writing to you to keep your promise to complete the process of releasing lands in the North and East, – and in this case, we are referring specifically to the village of Keppapulavu in the Mullaitivu district. In December 2017, some parts of the village was released, but acres of land remain occupied by the Army. This includes, residential lands located in close proximity to their livelihood of fishing in the nearby lagoon, agricultural lands, and a village school, church, Hindu temple and cemetery”. “The villages have been engaged in a day and night continuous peaceful protest outside the entrance to the Army camp, for more than 22 months – demanding the release of their lands. They have also been holding multiple discussions with officials and politicians. In the past, a village leader had threatened to engage in a fast unto death till their lands were released. We are concerned that they may resort to drastic action, if the promise you made, is not kept, and all lands not released”. The President should attend seriously to situations like this and make the people happy and confident, by solving the problems. These are very embaressing situations, as these are people’s lands and properties occupied by actions by the government.It could have been great if this was attended to before the ‘Pongal’.